C++ Performance Validator has always had the ability to provide timing information for each line executed. However it has always been a bit clumsy to use – you could only enable line timing for all the methods that were being timed. This could result in slow execution due to methods you didn’t want line timed being line timed. You could filter them by file using the “Hooked Source Files” filter or the “Hooked File Types” filter, but that was about as granular as it got. We’ve just introduced the capability to specify which classes, class methods and functions get line timed. So now, if you want to time just one function, or one method in a class, or time just the methods in a class, you can tell C++ Performance Validator to do that. To introduce this capability we’ve had to add an additional filters setting in the Settings dialog, we’ve updated the line timing warning dialog to allow you to edit line timing filters right from the warning dialog and we’ve had to update the context menus on all the displays to include new options for line timing filters. We’ve also had to update the display of filtering information on the line timing display. We’ve added a new “Line Timing Filters” section to the settings dialog. The image above shows three filters have been selected and that only the classes, methods and functions identified by the filters will be line timed. All other class, methods and functions will be ignored for line timing. All methods in the class seoPage will be filtered for line timing, as well as the method CSpellCheckTabDlg::addWord and the function strncasecmp. The Line Timing Warning dialog has been updated to allow you to edit line timing filters directly from the warning dialog. The Edit Line Timing Filters… button displays the Line Timing Filters dialog previously described. We’ve added a new submenu to the context menus on all displays and renamed the existing “Instrumentation” submenu to “Function Filter (instrumentation)”. The new submenu added is “Line Timing Filter (instrumentation)”. These new context menu entries allow you to easily specify that a class, a class method or a function should be selected for line timing. There are two main methods for using the line timing filters that come to mind. Specify the filters ahead of time. Specify the filters in response to function timing data you are looking at. This method relies on you knowing your software code and having a very good idea which methods you think need line timing. Open the settings dialog, go to “Line Timing Filters” and enter your filters as appropriate. Be sure to set the filters to include or exclude methods for the use case you think is useful. For line timing, most of the time we expect you to be using the include setting and specifying just a few methods to line time. Specify filters based on data. The alternative way of using line timing is in response to some profiling data that you already have. Ideally you’ll have recorded this profiling data with line timing turned off (you can turn this on/off from the launch application dialog). Once you have the profiling data, search for functions that you think will benefit from additional tuning. When you have a candidate function, right click to get the context menu, then select if you want to profile the whole class, just that class method or just that function for line timing. At the point you add line timing filters, if you have no line timing filters or the line timing filters are set to profile all classes, methods and functions, then the line timing filters will be set to profile just the classes, methods and functions identified by the filters. However, if there are pre-existing filters, the include/exclude setting of the line timing filter will not be changed – you will need to visit the Line Timing Filters settings dialog to change that setting if you want to switch from include to exclude or exclude to include. This design is deliberate as the main use case is to profile one or two methods (or all the methods in one class) – that use case is “include”, which is why this is the default behaviour. If you have already recorded a session with line timing data and you specify some line timing filters, C++ Performance Validator will update the line timing display to grey out the classes, class methods and functions that will not be instrumented on the next run. Once you have the filter(s) you need setup you can run a new profiling session to get the line timing data you need. We’ve just introduced some new visualisations of performance data into C++ Performance Validator and .Net Performance Validator. 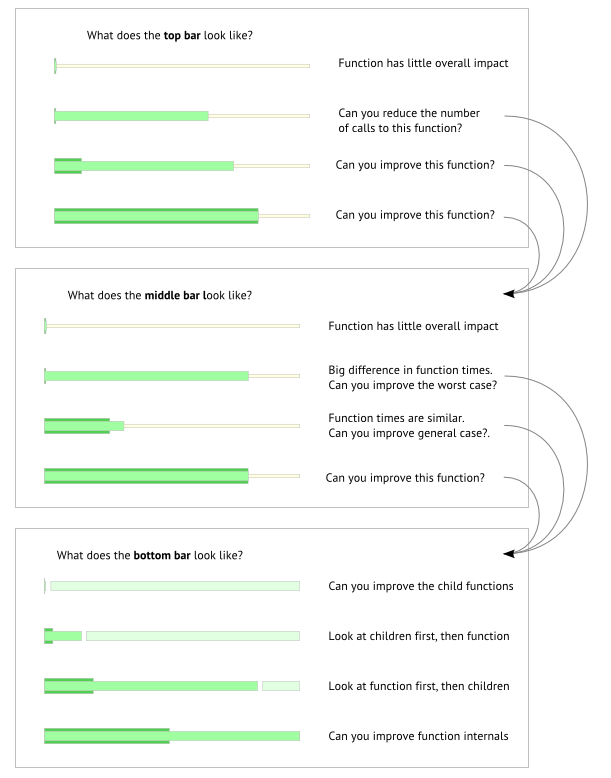 The new visualisations make it much easier to understand what is happening – the relationship between child and parent functions and where you should be looking to make performance improvements to your code. These are not awful, but they’re not brilliant – they don’t really help you understand what’s happening. We’ve replaced the above visualisations with some new visualisations that are easier to read, easier to understand and allow you make better conclusions as to where to focus in your code. The top bar shows the function time and the average function time as fractions of the total runtime. The middle bar shows the shortest function time and longest function time as fractions of the total runtime. The bottom bar shows the function time, the average function and the child time as fractions of the total time for the function. You can improve your code by looking at each performance bar and evaluating them as shown below. The top bar shows the line time and the average line time as fractions of the function time. The bottom bar shows the shortest line time and longest lines time as fractions of the function time. These allow you to identify the lines that are most dominant and also which have the greatest variability in execution time. The new visualisations provide more insight into the performance data than the previous visualisations. I’d like to mention the user experience consultancy Think UI for providing the design for these performance bars and for the very useful explanatory graphic that goes with them. For some time we have had tools for use with Perl in the beta stage. The reason the tools never left beta is because the instrumentation part of the tools was tool brittle. It relied up scanning the Perl binary for suitable insertion points then modifying the binary to insert a suitable profiling callback. The callback would then ask the interpreter for filename, line number and function name information. This worked fine so long as the version of Perl being used had data stored in the same format as the version we had inspected when we wrote the tools. As soon as the internal design of the Perl runtime changed our tools stopped working. The Perl interpreter has some rudimentary profiling capabilities built in. The are only suitable for gathering timing statistics and cannot be used to provide code coverage flow tracing or call graph timing results. The only was to get statistics for these uses is to build your own profiling API. That is what we have done with the Perl Profiling API. The PERL_PROFILER_EVENT event can receive values of PPE_LINE, PPE_CALL, PPE_RETURN. PPE_LINE is used for line visits, PPE_CALL is used when a function is called, PPE_RETURN is used when a function returns. The fileName and lineNumber specify which part of which fileName the code is executing, the functionName specifies the current function and the packageName specifies which package/namespace the function is part of (if any). The userData value is the value passed when setting the callback using Perl_set_coverage_callback() and/or Perl_set_profiling_callback. Perl_set_do_profiling() is used to enable or disable profiling with either of the callbacks. Pass TRUE to enable and FALSE to disable. Perl_get_do_profiling() is used to determine if profiling is enabled or not. The function returns TRUE for enabled and FALSE for disabled. Perl_set_coverage_callback() is used to set the callback that will be called for line visit events. The callback function will be called for all lines the Perl program visits. The userData value specified will be passed to the callback. Perl_set_profiling_callback() is used to set the callback that will be called for function call and function return events. The callback function will be called for all functions the Perl program visits. The userData value specified will be passed to the callback. By default the Perl Profiling API is not enabled and no callback values are set. To use the Perl Profiling API we need to define a callback to do the work. The implementation of storeLineVisitInfo(), startFunctionCallTiming() and endFunctionCallTiming() are down to the profiler writer. You can use these to implement a timing profiler, code coverage, flow tracing or some other tool. We also need to tell the Perl to use the Perl Profiling API. As you can see using the Perl Profiling API is easy. Adding the Perl Profiling API to the version of Perl you are using is also straightforward – there are two files that implement the API and two simple modifications to the runtime loop in dump.c and run.c. The overhead of the API is trivial when not in use and when in use the overhead is defined by what the callback writer chooses to do. Learn more about the sources and binaries for the Perl Profiling API. Speed up your MFC program without a profiler! I’m going to explain how to potentially improve the performance of MFC programs using CMap<> and related containers (CMapStringToPtr, etc) by a substantial amount. We use MFC for quite a lot of our software. We also use STL and also some custom containers. It is easy to fall into certain programming habits of using a particular container for a particular task. Sometimes the result is not what you expected! During the Christmas break I decided to write some software to analyse the Software Verification website log files. Initially I wanted to do keyword mining, but it soon blossomed into a stats package calculating different statistics for keywords, referrers, domains, URLs, favourite domains, bounce rates, evaluation download rates, etc. I was also reading the wonderful "Web Analytics an Hour a Day" book by Avinash Kauschik. And to top it all, I was ill. I’ve since been told by various people that I had Swine Flu. The initial version didn’t calculate much and was quite fast, but when I wanted to scale up to calculating monthly data as well as yearly, that was 13 times as much calculation and the inefficiencies in container choice started to show. I’d been lazy, this was a hobby project, nothing serious, so I’d chosen the MFC class CMap. I wanted to map keyword strings to countData objects which would hold all the data on that keyword. Later we could discard the map and just use an array of keyword objects for random access and sorting. I wanted data for unique keywords, so during processing of the data it seemed natural to want to map the keyword to the keyword data. I was doing similar things for referrers, referring domains, requested URLs, etc. The problem with the CMap<> class is that its hash key calculation isn’t very sophisticated, so you get collisions reasonably quickly, which forces the CMap to start making linked lists for the non-identical collisions, and walking the linked lists for subsequent searches is linear time. That gets slower as you add more data. This is not a hash table, its a B-tree, so it will use more memory than the hash map, and unique entries should be slower than the hash table, but colliding entries should be faster. With this new style of map substituted all over the program, for all the many unique datatypes being calculated, the processing time dropped from 36 hours to 1 hour. In other words, the STL version processed the data in 2.77% of the time the MFC version processed the data. That is a 97% improvement in processing time. I am not saying that you will get this improvement. This improvement was acheived partly because of the type of statistics being calculated and partly due to the input data having so many collisions. The dataset for the above test was 17.1GB of Apache log files. For a sample 34MB input file, the MFC program processes the data in 12+ seconds and the STL program processes the same data in 6+ seconds. An approximately 50% improvement. For a sample 2GB input file, the MFC program processes the data in 22 minutes 46 seconds seconds and the STL program processes the same data in 5 minutes 21 seconds. An approximately 76% improvement. The larger the dataset, or the more different CMap<> you are using calculating the data, the chances are that changing them to STL <map> would be highly effective in speeding up that part of your application. Note that if you are only loading a few tens of items into the map, it will not be worth making the change. You can download the executable and the source code with project files so that you can test this yourself. I don’t recommend changing all occurrences of CMap<> for STL <map>, but changing a the right ones should make some easy and worthwhile gains for you. A while ago a German University Robot Football team asked us if we could help them with their software. We provided Performance Validator to them to see what they could do. Today we found out. The Darmstadt Dribblers have just taken their robot Isra to RoboCup 2008, held in Suzhou, China. They came 4th in the championship (24 teams competing), losing to the championship winners (also from Germany). The other two quarter finalists were both from Japan. Thats a good result, against some good competition. Isra running to the ball. Still think software engineering can’t be fun? We’ll be reporting on the Dribblers’ performance as they enter more competitions.